Dwayne Buhler will be moving on this spring, after having led Mission Fest Vancouver since 2007. 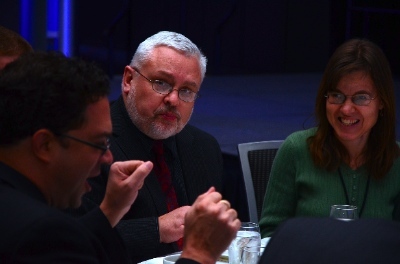 Since 2007, Dwayne Buhler has been executive director of Missions Fest Vancouver, the large and popular event that takes place each year ‘under the sails’ at the harbour-side Vancouver Convention Centre. Shortly after the end of this year’s Missions Fest (January 24 – 26), he spoke with Lloyd Mackey about the last few years and his plans for the future. We wish Dwayne well, as he and his wife Rhonda consider the next step in their involvement as mission leaders in an increasingly complex global setting. Lloyd Mackey: What have been some of your most memorable experiences with Missions Fest during your years there? Dwayne Buhler: I would have to say that the main highlight of working with Missions Fest has been to rub shoulders with the men and women who lead our volunteer teams, board members, and church leaders and pastors who have supported and encouraged us. But I have to add some other things: It’s been great to meet the speakers and work alongside the great people involved with the agencies. For me the interdenominational, intergenerational and intercultural nature of Missions Fest – giving a real sense of what I think the church is supposed to look like – is what fuels my tank. I’m also thrilled to see how the Film Festival has developed, giving a voice and a venue to those who are telling the ‘God stories’ to this generation. We’ve seen people inspired and called – I never get tired of hearing about the people who made a connection or commitment at Missions Fest, and are now ‘out there,’ involved in local and global missions. LM: What are your interests as you look forward to the next step? Any particular plans you want to share? Dwayne and Rhonda Buhler are still thinking through what will come next, but they hope to draw on their experiences during their time as missionaries in Latin America. DB: About a year ago my wife, Rhonda, and I began to pray about our next steps. We understand that our 15 years in Brazil and Mexico, knowledge of Portuguese and Spanish, and our love for Latin America, are part of who we are. Our hope is that wherever we end up, that we will use these in a ministry setting, which could be international, or serving from a North American base. Things right now for us are not well-defined, but I’ll keep people in the loop as they become clear. 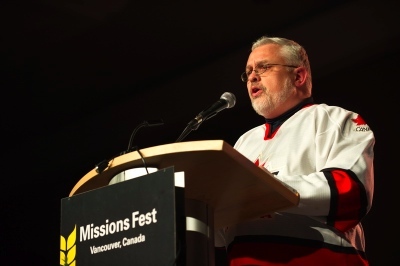 With a sense of an upcoming change, I informed the board of Missions Fest Vancouver last March that they should begin working towards finding my replacement. They have worked on this through the last months and are in the process of interviewing potential candidates. They’ve asked me to see things through up to our AGM in May, giving some time for me to mentor my successor. LM: Any comments on the burgeoning missions festival/events field and what kind of global impact it is likely to have during the next decade or two? DB: I tell people that only eternity will reveal the impact that an event like Missions Fest can make. It’s amazing to think about God’s faithfulness over 31 years. I think there is still a future for a large-scale event like Missions Fest because it meets a need in the body of Christ. All too often believers feel like they are alone; that their small church or group are like an Elijah (1 Kings 19) that doesn’t see the other 7,000 that haven’t bowed their knee to the pressures of the people and environment around them. But coming together at an event where there are other Christians worshipping is especially encouraging and impactful. LM: What kinds of developments do you anticipate for missions/missional activities in the light of postmodernity and changing relations with other world religions? The growing missionary movements in the developing world call for new forms of partnerships; partnerships that are not just based on sending money, which is too often a guilt-based way of supporting missions. We still need to find new ways to work together as equals. There is the phenomenon – ‘boomerang missions’ – where immigrants return to their homeland. They alone are the reason why Canada continues to maintain the number of missionaries it sends out. At the same time there is a resurgence of interest in missions, especially in younger millenniums. Here is a generation that wants to change the world. They’ll do things differently than you or I do them, as they are not tied to denominations or organizations. We often hear of a generation that is either ‘falling away’ or giving up on their faith. But there are many who want to live out their faith in authentic, purpose-filled, missional lives. For that reason I see many new organizations springing up – smaller agencies that have a holistic focus, less bureaucracy and a heart for authentic expressions of Christianity. It’s also why there is an incredible need for seasoned leaders to play a mentoring role – enabling and championing them. That’s not good news for the bigger, older and traditional missions agencies who are feeling the effects of an aging demographic of supporters and retirement of their missionaries on the field. But if North American organizations don’t adapt to these changes, they will shrivel up and die. That’s why it is so important to reach the next generation – either you morph, or mortify!